Shri. 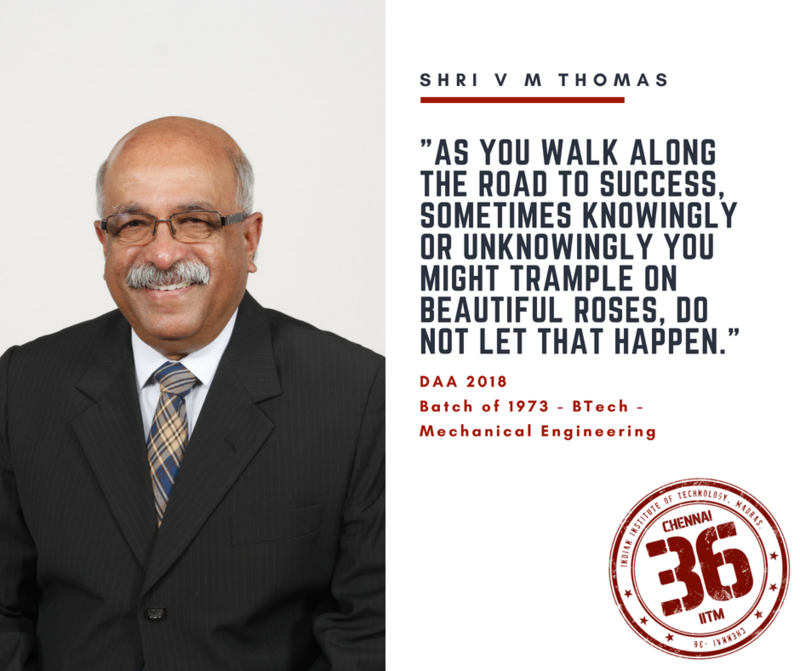 V.M Thomas graduated in 1973 with a B.Tech in Mechanical Engineering from IITM. After graduation, he went on to work with HAL, TI DIamonds, and Johnson Lifts, where he is now the Joint Managing Director. He was awarded the prestigious Distinguished Alumni Award on 26th April 2018. The Chennai36 team caught up with him for a short interview! Congratulations on being conferred the “Distinguished Alumni Award 2018”! What thought/feelings are running through your mind on this occasion? Three things went through my mind. First, I became very emotional. Secondly, I felt very proud! And lastly, I thought to myself that I must interact more with IITM. Can you give us a brief glimpse into your time here at insti? What are some of your enduring memories about and/or with this place? Plenty of fond memories associated with this place, during your formative years is when you join, and those memories remain with you forever. For example, periodicals, workshop, hostel life, Saturday movies, hostel nights and of course the Mess. The fun we had was enormous those days. There were a lot of fun things I did, but I don’t want to reveal it here (laughs). You worked at HAL, and then at TI Diamonds, before joining Johnson Lifts. Going from aeronautics to manufacturing, and then to escalators and elevators, what has the journey been like? Those days, getting a job was not easy and I always wanted to work in India. I had a few offers, all of which came from the public sector. It so happened, that the offer from HAL was on my birthday. My father said, okay, you take this offer and that’s how I joined HAL. Not that I wanted a job in a specific industry! HAL being a public-sector undertaking offers a lot to learn. New technologies and new equipment were there. But the only sad thing is that you’re not very accountable and nobody asks you questions. Those days, we used to work on a (cost + 10%) budget. This means; whatever be the cost of an aircraft, we sell it at 1.1 times to the Indian Air Force. So, there wasn’t much space for innovation and no space for cutting down costs. This was one major drawback of working in the public sector. Also, talent is rarely recognised there. Hard work doesn’t get recognised. You get your standard 25-30 rupees increment annually and promotions based on vacancies and other factors. I thought that this is not the place for me to be working and moved on to TI Diamonds. Now I saw the difference between the public and private sector. In the private sector, it is all about the bottom line. We are always under stress. There is always a cost to something and we are always looking to reduce that. It could be for the materials, it could be the processes, or it could be to reduce the cycle time cost, or even through innovations. So, we are always under stress to bring down the cost. I remember an incident when my General Manager sent me a note saying, “ Mr Thomas, you’ve drawn 15kg of cotton waste extra, over the budget. Please explain!”. If I had drawn 1500 kg of cotton waste in HAL, no one would have questioned me. This is the major difference between working in these sectors is what I have learnt. Johnson lifts is one of the market leaders in the elevator industry in India. What were your experiences working with them from the time you joined and to the position you have risen to now? I joined Johnson Lifts in 82’, in the 80’s the market for elevators were very limited, hardly any market for it back then. The only multinational operating in India at that time was OTIS. The problems I faced when I first joined Johnson Lifts were that basically being a very small-scale unit in private sector, there were no systems or drawings. Quality assurance was a big issue. Another major problem was that of the batch size, in a month we were producing only 2-3 elevators. Every component had to be manufactured in-house, no way we could subcontract it since nobody would come forward to manufacture 3 or 4 components. As the years went by, the market grew, government policies changed and so we changed ourselves according to the changing scenario. For example, we were always on the look-out meaning keeping our eyes and ears open all the time. We used to attend all the Elevator exhibitions all over the world. Two major ones were the lift exhibition in Ausberg near Stuttgart Germany and another in China. So, we used to see what’s happening in the industry and we used to get those inputs to India. One important thing is that we were the first to bring in VVF(Variable Voltage and Frequency) drive elevators to India in 1992, even before OTIS could think of it, which gave us a big push. By this time the Govt. had opened up. Then onwards, importing machinery became simple. Earlier to that, even a visit to Europe or USA required an RBI clearance. 50 USD per day used to be a big deal. That was the growing phase of the company. Throughout your career, you have been associated with companies like HAL, TI Diamonds, and Johnson Lifts; all of which have a strong national focus. What are your thoughts on manufacturing in India and the “Make in India” campaign that has gained momentum lately? There is no particular reason for my choosing to work in these companies. I wouldn’t call myself as a very big nationalist, but I’ve always wanted to work in India. I didn’t want to go abroad. That was very clear to me. I would say it is by choice. Manufacturing looks at 3Ms; materials, machines, and manpower. In today’s world, the best of both, machines and materials are available to you. The third thing is manpower. That is the only place where you can cut down costs. India is a country where we have a large number of people available with skills. So, I think we should capitalize this. The recent move of the government, privatization of the defense sector, is a welcome move. It is bound to create many jobs. My thumbs up to the “Make in India” movement and manufacturing in India. It is a good initiative according to me. We have come to understand that apart from being a top-notch professional, there is a social activist in you! It would be great if you could share with us what you have done on that front? Off late, I’m not all that active. Earlier yes! I was associated with the Blood Bank, YMCA, and also president of the Kerala Catholic Association and other small groups. I’m still associated with YMCA by sponsoring some of their programs and the Blood Bank. But Blood Bank was the one which gave me immense satisfaction, I was a trustee, then a secretary, vice president, and the President. In the 80’s and 90’s, Chennai used to be a medical center attracting patients especially from the North-East, West Bengal and from Malaysia, Dubai and Abu Dhabi. Many of them come mostly for surgeries and surgeries require blood and they don’t know where to go. Those days professional blood donors were thriving, so we stepped in and provided Safe Blood. Hospitals then started directing the patients to us and we would take their calls and act on it. I used to get calls from the people saying “Thank You so much for the blood, you saved my son/father etc”, which is a wonderful feeling. Even now, I get requests from friends/associates for blood which is arranged by sending our workmen/colleagues. What are some changes you observe in the institute; ‘insti’, as we call it in our lingo; since your time here? I am sure you have visited the institute quite a few times after graduating. Now, all I see are buildings and buildings everywhere! This is a sad thing. In fact, I told someone earlier, that maybe we should have thought of another campus somewhere close by. Then, we could have planted trees and things like that. The 2016 cyclone led to a massive loss in green cover. I am a nature lover. I have planted over 3000 trees in my farmlands. Trees are very close to my heart. This is the only striking observation I can make. What advice would you give to the current students at IIT Madras? I don’t think there is any Mantra as such! As far I’m concerned it is hard work and sincerity. You will make mistakes, but accept them because, from my experience, no one will “chop” your head off. If you are sincere nobody does that. Second thing is that, keep your eyes and ears open all the time and see what’s happening around you. Third thing is that you’ve got to be innovative, look for alternatives all the time. One advice is that, as you walk along the road to success, sometimes knowingly or unknowingly you might trample on beautiful roses, do not let that happen.